From left, Sun Valley Ski Education Foundation alpine ski racers Madison Ferris and Libby Kaiser get ready to blitz last weekend’s Basolo Memorial/Monroe Cup course on the Warm Springs side of Baldy. Sun Valley Ski Education Foundation alpine ski racers ages 7-12 dominated the podium and won five of the eight races during the Lonnie Basolo Memorial/Monroe Cup giant slalom and slaloms Saturday and Sunday, Feb. 26-27 on Baldy. Will Snyder captured both of the J4 (ages 11-12) boys' events while, in J5 (9-10), the SVSEF race winners were Jake Blackburn (SL), Molly Milgard (GS) and Lily Fitzgerald (SL). Podium performers included Kyle Maxwell, Wyatt Smith, Will Griffith, Buey Grossman, Fletcher Stumph, Sage Rheinschild, Katelyn Rathfon, Libby Kaiser, Sage Curtis and Marit Kaiser. 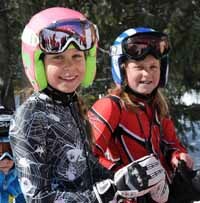 SVSEF kids accounted for 78 positions in the 180-racer Intermountain Division North Series field. Basolo was a 1984 Wood River High School graduate and Hailey Ski Team racers who died 25 years ago, on March 19, 1986 in a ski accident at the bottom of Baldy's Flying Squirrel ski run. He was 19. The race in his memory was first held in 1988 on Dollar. J4 (ages 11-12) boys: Will Snyder 1-SL/1-GS; Wyatt Smith 3-SL/2-GS; Kyle Maxwell 2-SL/18-GS; River Vorse-Whittier 5-SL/DNF-GS; Yuri McClure 5-SL/DNF-GS; John Blackburn 7-SL/5-GS; Kristian DeWolfe 9-SL/15-GS; Matteo Jorgensen 10-SL/13-GS; William Lind 13-SL/31-GS; Noah Leininger 20-SL/8-GS; Cooper Dart 18-SL/10-GS; Tobias Verheijen 17-SL/12-GS; Duncan Fuller 4-GS; Travis Flynt 16-SL/16-GS; Clay Cutler 24-SL/22-GS; James Everitt 23-SL; Patrick Welsh 25-SL/27-GS; Aidan Allchin 27-SL/30-GS; Keegan Webber 28-SL/32-GS; Harrison Mayesh 30-SL/29-GS; Mac Mizer 35-SL/33-GS; Cade Street 36-SL/35-GS; and Travis Wilkinson DSQ-SL/34-GS. J4 girls: Sage Rheinschild 3-SL/3-GS; Katelyn Rathfon 4-SL/2-GS; Margot Griffith 8-SL/6-GS; Pinar Pennell 14-SL/9-GS; Royce Rheinschild 10-SL/11-GS; Poppy Vorse-Whittier 20-SL/12-GS; Hallie MacPherson 16-SL/20-GS; Riley Revallier 23-SL/16-GS; Isabella Welsh 19-SL/30-GS; Bailey Holter 25-SL/22-GS; Remy Vernoy 29-SL/26-GS; Alyssa Ritzel 30-SL/35-GS; Dylan Millar 31-SL/34-GS; Katie Peters 32-SL/33-GS; Emily Watts 34-SL/39-GS; Olivia Ott 35-SL/38-GS; Lane Letourneau 36-SL; Alice Hoffer DNF-SL/36-GS; and Scottie Berridge 37-GS. J5 (ages 9-10) boys: Jake Blackburn 4-GS/1-SL; Wyatt Minor 5-GS/4-SL; Will Griffith 8-GS/2-SL; Bennett Snyder 13-GS/10-SL; William Everitt 14-GS/9-SL; Matt O'Connor 16-GS/18-SL; Charlie Stumph 20-GS/6-SL; Jackson Swenke 21-GS/16-SL; Harrison Blamires 23-GS/15-SL; Ethan Daves 20-SL; Barrett Ott DNF-GS. J5 girls: Molly Milgard 1-GS/2-SL; Lily Fitzgerald 2-GS/1-SL; Madison Ferris 5-GS/4-SL; Allison Rathfon 10-GS/7-SL; Sophia Schwartzman 11-GS/10-SL; Libby Kaiser 3-GS/DSQ-SL; Laine Allison 13-GS/DNF-SL; Lucy More DSQ-GS/13-SL; Kaia Jensen 18-GS/25-SL; Payton Bacca 23-GS/20-SL; Tatum Fuller 26-GS/DSQ-SL; Aurora Wilkinson 34-GS; Blake Letourneau 35-GS/30-SL; Alexandra Stuessi 36-GS/28-SL; Murphy Kendall 37-GS/31-SL; Giselle Harmon 26-SL; and Sylvia Cogen DSQ-GS/DSQ-SL. J6 (ages 6-8) boys: Buey Grossman 2-GS/2-SL; Fletcher Stumph 3-GS/6-SL; Josh Blackburn 6-GS/4-SL; and Charlie Snyder 7-GS/11-SL. J6 girls: Sage Curtis 2-GS/2-SL; Marit Kaiser 3-GS/4-SL; Jessica Blackburn 7-SL; and Anhwei Kirk 9-GS/8-SL. Intermountain Division super giant slalom races at Boise's Bogus Basin and McCall's Brundage Mountain got 36 Sun Valley Ski Education Foundation alpine kids testing their speed on the Idaho hills last weekend. J2 (ages 15-16) Connor Farrow had an outstanding series on Bogus' Paradise run during the Trudi Bolinder Memorial SuperG Feb. 24-26. He made the J2 podium all three races, second twice, and was eighth overall of 54 competitors the last two races. Sierra Fox, a first-year J1 (17-19) entrant, led all 30 female finishers in Saturday's 42-gate finale. J2 Amanda Stelling was fourth in her class twice and rose as high as sixth overall of 27 girls in the first SG competition. J1 boys: 8—Miles Sweek. 9—Harlan Collins. 12—Tanner Dirstine. J2 boys: 2—Connor Farrow and Ben Kanellitsas. 11—Colin Waycott. 14—Cole Caulkins. 21—Taylor Adler. 27—Logan Shipley. J2 girls: 4—Amanda Stelling. 11—Petra Zeiler. 18—Sofia DeWolfe. Twenty-three SVSEF J3 (ages 13-14) ski racers competed among 110 Intermountain kids in the Brendan Armstrong Memorial super giant slaloms Feb. 24-26 sponsored by the McCall Ski Racing Team at Brundage Mountain Resort near McCall. After a couple of DNFs, William Harder came up with the best-of-weekend Sun Valley boys' finish with a second place in Saturday's SG on Sidewinder/Alpine run. Tanner Josey cracked the top 10 three times. Samantha Busby also climbed the podium in second place. Jordan Fitzgerald and Haley Cutler had fourths. Coming up for the J3 group: The Craig Kjesbo "Cheeso" Memorial J3 qualifying races (giant slalom, slalom) on Saturday and Sunday, March 5-6 on Baldy's Hemingway and Greyhawk ski runs. Awards are Sunday at 3 p.m. on the Apple's deck. J3 (ages 13-14) boys: 2—William Harder. 9—Tanner Josey. 16—Jay Fitzgerald. 17—Austin Savaria. 18—Taylor Cooper. 25—Griffin Curtis. 29—Emmett Say. 39—Gavin Shipley. 42—Michael Levy and Peter Hastings. 43—Carson Jones-Wilkins. 48—Elliot Lewis. J3 girls: 2—Samantha Busby. 4—Haley Cutler and Jordan Fitzgerald. 14—Madison Milgard and Josie Allison. 17—Julia Vorsteveld. 20—Olivia Wentzell. 25—Alexandra Black. 31—Chloe Francois. 32—Loni Unser. 39—Megan Murphy.